Editor’s Note: This article is part of Rambo Week here on blademag.com. Download the Rambo-themed issue of BLADE magazine here. 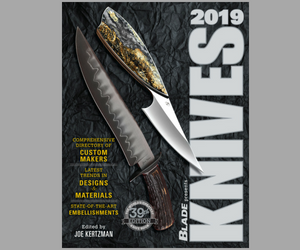 The impact of the Rambo movies and Rambo knives on both modern culture and the knife industry has been monumental over the past three-and-a-half decades. In this, the 35th anniversary year of the original Rambo movie, First Blood, BLADE® asked me to do a story on Sylvester Stallone and what has become the worldwide phenomenon of Rambo. There is no knife in David Morrell’s novel, First Blood. It was Stallone’s idea to give Rambo one. A knife collector in his own right, Stallone wanted Rambo to have a great survival knife that looked good on film. Ellithorpe recommended Lile and Stallone contacted the Arkansas maker. Stallone stated he told Lile what was in the script rewrites for what would be required of the knife, and Jimmy took care of the rest. Lile gave the first six First Blood knives he made to Stallone, all of which survived the standard amount of wear and tear from the movie’s many takes. Lile made the first two knives for the Rambo movie franchise, including Rambo 2: The Mission, which Stallone called “the fans’ favorite” and which is why he used it in a boat scene in Rambo IV (DVD extra deleted). For Rambo III, though, Stallone wanted to go in a different direction, that is, more of a fantasy look. Unlike with the Lile knives, Stallone had a lot of input on the Rambo III model. In fact, according to Mrs. Linda Hibben, the Rambo III knife is the most popular knife Gil has ever made. To prepare for the role of Rambo, Stallone received some training in knife use, “a little from ex-military folks,” he noted. He also studied real stories of those with experience in using the type of survival knives in the movie. If the knives look real in First Blood, that’s because they are. However, in the second film molded resin versions of Lile’s handmade knives were made to help protect the actors during live takes. In Rambo III, unsharpened aluminum prop knives were used along with the real Hibben knives. Rubber stunt, aluminum and steel versions of the knives all were used in the fourth film. “Most were destroyed on set but a very few still exist today,” Stallone wrote. Those include a Rambo II resin version prop knife, a Rambo III aluminum knife that looks great and is very lightweight, and all types from Rambo IV—rubber, aluminum and steel. “They all look good. You can’t really tell them [from the real thing] just by looking—you have to pick them up,” he stated. Will There Be a Rambo 5 Knife? He still has a few of the original knives from each film and keeps them “proudly on display.” He does not clean them and keeps them in the same condition as they were after each movie. According to some reports, Stallone has indicated he will never do another Rambo movie. Download this special issue of BLADE that’s all about these iconic movies. Randy Rousseau is a BLADE contributor.